​"the kid who would be king"
THE STORY - Old-school magic meets the modern world when young Alex stumbles upon the mythical sword Excalibur. He soon joins forces with a band of knights and the legendary wizard Merlin when the wicked enchantress Morgana threatens the future of mankind. THE GOOD - A fun family film that combines a great script and enjoyable performances to bring a delightful experience to the screen. ​​​​With the last film that he wrote and directed, “Attack the Block," Joe Cornish created a brilliant sci-fi story that deftly blended political commentary with a low budget alien invasion thriller. He attempts something similar with “The Kid Who Would Be King," but instead of poverty and governmental abuses he tackles growing up and learning about the hard realities of the world and packages it all in a fun modern fantasy story. While it has a completely different focus and intended audience, it is just as skilled at relaying its message in a relatable and entertaining film that will please adults and kids alike. The film opens with a gorgeously animated explanation of a slightly adjusted mythos of King Arthur and sets the scene for the return of the evil witch Morgana and the rise of a new hero to wield the legendary sword Excalibur. The rest of the film is set centuries later, where Alex (Louis Ashbourne Serkis) and his friend Bedders (Dean Chaumoo) are not the most popular kids in school, but at least they have each other to rely on. Unfortunately, the school’s biggest bullies, Lance (Tom Taylor) and Kaye (Rhianna Dorris) have it out for them and after Alex attempts to fight back, the bullies swear revenge and end up sending Alex running into a construction site to hide. There he finds a sword embedded in stone and lo and behold he can pull it out. He brings the sword home and after a quick discussion with Bedders and some minor research he comes to believe he has found Excalibur. The next morning we see a young man walk out of the standing stones of Stonehenge, he then appears at Alex’s school, and is seemingly fascinated by him. That night Alex’s ideas about the sword are proved true when a fiery demon soldier appears at his house and he is only saved by the young man from school appears seemingly out of nowhere to vanquish the enemy. He reveals himself to be Merlin (Angus Imre) the wizard and tells Alex that doom is on the doorstep and only he can save humanity from Morgana who is set to return in four days’ time when the solar eclipse will hide the sun from the Earth. Faced with the possible death of the world, Alex convinces the bullies to join his side and they embark upon a quest to find Alex’s long-absent father and save the world, even if it means skipping school. “The Kid Who Would Be King” is a simple coming-of-age fantasy story at its heart, but the script elevates it beyond the usual strictures by exploring current family issues. It weaves together complex story beats with believable dialogue and embraces the modernity of its story which allows the characters to feel believable and sympathetic instead of stilted and formulaic. The relationship between Alex and his mother is particularly affecting due to Cornish’s willingness to explore the deeper and more painful-side of their connection. One of the best things about Joe Cornish’s filmmaking is his trust in his younger actors, he allows them to be heroes in his script and on screen. Their realistic performances add something to his films that are rarely captured in movies aimed at younger audiences, an authenticity that portrays the unsure and ever-changing reality of the period when childhood transitions to adulthood. 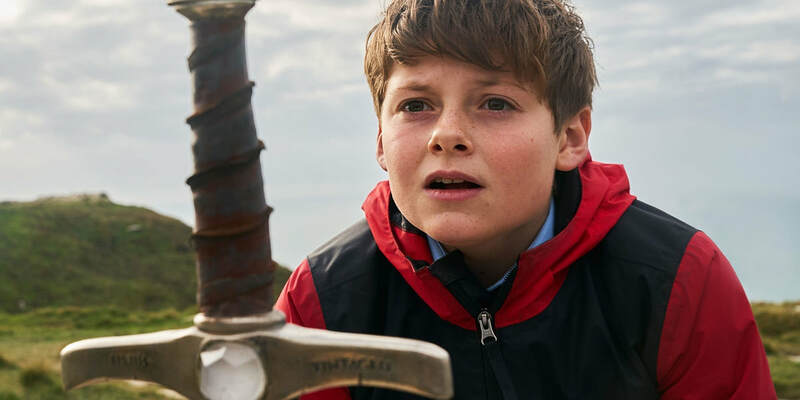 Joe Cornish managed to tick almost all the boxes when he made “The Kid Who Would Be King." He brings together an interesting and fresh cast, headlined by a breakout performance by Angus Imre as Young Merlin, a great script, well-designed music, and good production values to create something that is appealing to a wide variety of viewers. Unfortunately, the film is about 15 minutes too long and would have benefited from some tighter editing. Despite that, “The Kid Who Would Be King” has all the makings of a classic and is an enjoyable experience no matter what your age.